In Mauricio Pochettino’s first year we lost one in six in the league in December and beat Chelsea 5-3 on New Year’s Day. In his second we lost one in six in December, and then went on a six game winning run in the league from mid-January. This season — his third — we’ve started converting draws into wins. We’ve won five in a row, scoring 15 and conceding three. Once again, we’ve clicked around the same time. Pochettino loves this period, with the hectic schedule allowing his players’ superior (and peaking) fitness to come to the fore, blowing away the early season cobwebs and putting teams to the sword with intensity, power and precision. Are there reasons for the slow starts in general? Maybe. This season has been slightly different, due to the European Championships, due to Mousa Dembélé’s suspension and then niggling injuries, and due to other injuries in basically every key position — Hugo Lloris, Harry Kane, and a particularly lengthy spell for Toby Alderweireld stand out. Dele Alli was struggling for form — and, as we saw on Wednesday, he’s so reliant on Christian Eriksen playing well. Eriksen took a while to find his stride too and I think he, in turn, is fairly reliant on Dembélé, and so it’s a bit of a vicious cycle. Dembélé’s not yet back to where he was last season, but his first half against Chelsea showed signs of his getting there and, besides, Spurs are learning to cope without him playing at 9/10 levels every week. Where Eriksen is now pulling the strings in nearly every match, that wasn’t the case earlier in the season. Kevin Kilbane offered some interesting analysis post-West Ham match on Match of the Day 2 which, if you’re lucky, you can still watch here (from 31:20 on). In the clips he shows, Eriksen’s movement was not allowing others to find him, not dragging defenders away, and not allowing him to influence the game — Kilbane says ‘just because you’re playing as a number 10 doesn’t mean you stand where a number 10 is’. 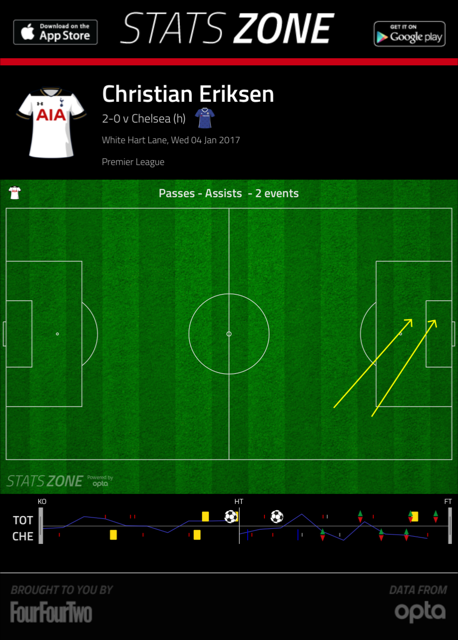 Since then, Eriksen’s confidence has returned and he’s demanding the ball, driving into space, and showing a willingness to take the ball on the half-turn and think about moving forwards first, rather than wanting to take a touch and then decide whether he has the space to do so. I’ve thought for around three seasons now that Eriksen’s slightly better when he starts ‘off-centre’ (in pockets of space) and works his way into the middle. Somewhat surprisingly, though, it’s been a switch to the right which has seen him find his best form. The Chelsea game was undoubtedly one of his strongest performances of the season, and his two exquisite crosses came from pretty much the same area, having received passes from Kyle Walker in both cases. Part of Spurs stepping up their levels might well be the return of Toby Alderweireld. He missed the Southampton match, but played in the other games in this period. In fact, we’ve only lost twice this season (to Monaco and Man United) when he has played a part — P15, W10, D3, L2 — which is no great surprise. Alderweireld’s return has allowed us to switch to a back three, and he’s played in the middle of that back three in the last three matches. The downside of that is that there’s less scope for him to play his wonderful diagonals, but the upside is that having an extra defender allows him (and the other two) to occasionally join the attack, which all of our centre-backs do well. Then right at the end Alderweireld's like 'I'm getting in on this too' & my heart's saying 'YES TOBY' & my head's saying 'OH GOD NO TOBY'. Personally, I don’t think this defensive shape change is a huge deal. 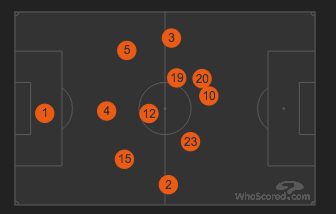 When we play 4-2-3-1 or 4-1-4-1, we generally have a player drop in between the centre-backs to allow us to play out from the back. Eric Dier in his holding midfield role did this better than Victor Wanyama has so far this season, but Wanyama still made that move regularly. 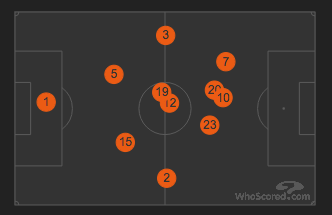 The difference in the 3-4-3 (or 3-4-2-1, or whatever you feel like calling it) is that the centre-backs take turns to move into midfield (and beyond!) once we’ve progressed the ball forward, rather than a midfielder shuttling backwards and forwards to get things started. Interestingly, when Dier and Wanyama started together in midfield at the beginning of the season, fans bemoaned our stifled creativity and the defensive nature of that selection. In this formation, though, I’ve heard few complaints, despite the fact that we’re essentially starting with a more defensive player at the expense of another in the band behind Kane. Perception? Pochettino has made it very clear that whether it’s three or four at the back, our philosophy remains the same. The pressing triggers remain the same. The full (or wing)-backs providing the width remains the same. The attacking midfielders playing narrow remains the same. The perfect storm of Toby’s return, our roaring fitness levels, the formation tweaks, Dembélé/Eriksen/Dele/Kane each going up a notch — probably because each of the others have! — and the all important momentum has led to Spurs’ upturn, and if this continues, it’s difficult to see who can stop the coys-train. Except next up in the league is West Brom, who manage to disrupt us every season (or so it seems). Last year we had two 1-1s, and the year before they beat us 1-0 at White Hart Lane. Pochettino will genuinely see this as a huge test, and getting a(nother) win would set us up nicely for City away. It took Arsenal 75% possession and 26 shots to grind out a 1-0 against the Baggies, so it might require a lot of patience and a moment of magic but, right now, we seem to have the players who can pull that off. Further reading – some articles I’ve enjoyed this week. Dan Kilpatrick on Dele for ESPN. Michael Cox on 3-4-3 for The Guardian. Michael Cox (again) for ESPN on Christian Eriksen. Plus here’s something I wrote about the transfer window. even though a 3421 'sacrifices' an attacking player compared to a 4231, when the 'attacking' player is the defensive-minded Lamela, the difference is negligible. in fact, taking away an attacking midfielder actually increases the space for Eriksen and Dele to use. in my opinion Alli has always been better drifting in from the left hand side, so i'm very pleased to see evidence that Eriksen is better slightly right of centre. there is still a time and place for a 4231, but i am in no doubt that the 3421 is the formation that gets the most out of our players' skill sets and i hope to see it 90% if the time from now on. i have moaned for a while that without a plan B we were becoming predictable and easy to defend against. never did i dream that our plan B may well be more effective than the plan A that saw us lose 4 times in 36 League games last season (before we stopped caring once the title had gone). we are just getting better and better. I think being able to roll out either formation depending on available personnel really helps with Pochettino's want to have a small squad too - it gives us the ability to cope with fewer players than we otherwise might have. Excellent blog, Windy. The unique thing about our back-three of Vertonghen, Toby and Dier is that they've all played at full-back and DM, as well as centre-back. They are all 'ball-players'; and can step forward when needed to help an attack. Wanyama is very good at dropping-in to cover the position vacated. Total Football. Cheers, mate! Yes, very versatile defenders, which I definitely think is a Poch requirement (and perhaps why Wimmer is not fancied so much?). I think that's exactly right with Eriksen potentially dropping deeper and I made the same point on Reddit. Dembele could even maybe perform the Wanyama role at a stretch. Great article spot on as always. There is no doubt that playing two wing backs suits us and you could question the fact that possibly this will become our plan A with our strength in depth at centre back with 5 v strong defenders it seems to allow Ericsson more room to get on the ball, and dier becomes our second striker but when we lose the ball he drops into the left off midfield to make us very solid and out number our opponents.. which still gives you the very strong spine of Hugo Toby weinyamah and Kane. As far as lamela is concerned as I have tweeted before. I have been told months ago his problem is not his hip or any other injury but something else which I won't put in print. Which unfortunately seems to have some substance with him being allowed to go to Argentina and now going to Rome and yet still no date of return. He is a player that has grown on me but I wonder where his future lies! Thanks for the blog as always Windy. I do agree with your comments, but the month of November was always going to be our difficult one overall, whether Toby played or not. It was predicted beforehand and proved to be so. The upturn in results have coincided with the types of games we have had lately. There are a few testing ones coming up, but not the run we had then.